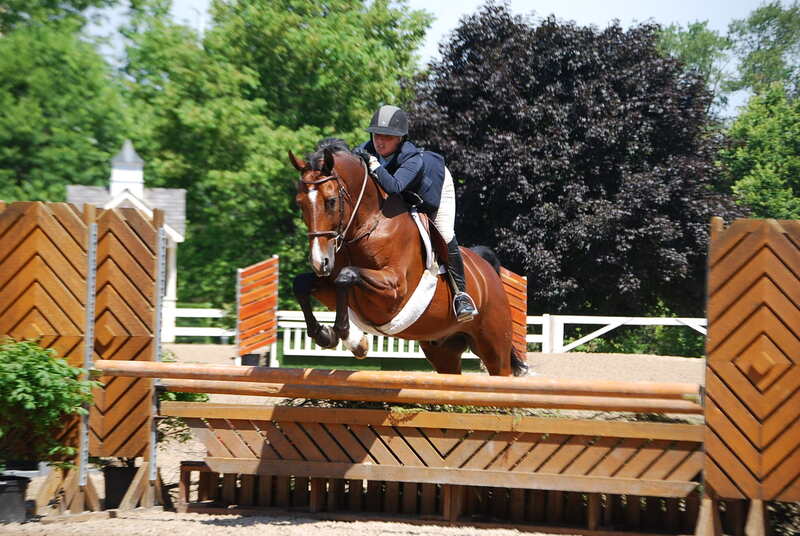 Jennifer Alfano and Candid were shining stars in the $5,000 USHJA National Hunter Derby at Equifest I.
Wayne, IL – July 24, 2015 – Equifest I featured the $5,000 USHJA National Hunter Derby at Lamplight Equestrian Center. Twenty-nine riders took the opportunity to show off their horses to the judges Frank Willard, Pat Bostwick, Oliver Brown and Thom Brede. Dean Battaglia designed the derby track in the scenic Wisconsin Equine Main Hunter Ring with bending lines and long approach single jumps. Four high options were available on the bending lines and the beautifully landscaped facility added the final touch to the class. Early in the class, Tiffany Hammack and Ducati set the pace scoring 90 plus four high options for 94. 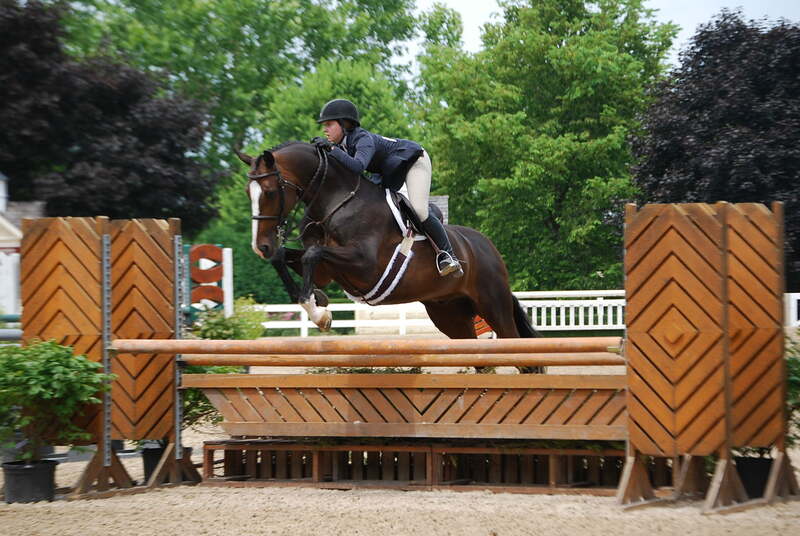 Molly McAdow and Charlie Brown were the next highest early score with 86 plus four for 90. It wasn’t until the bottom of the class that Jennifer Alfano and her mount Candid, earned a 91 plus four for a total of 95 to take over the lead. Rounding out the top scores in round one was Russell Frey with Kodachrome, earning an 87 plus four for 91, keeping the top scores close. Scores of 83 or better returned for the second round with Alfano and Candid at the top of the leader board. Riders tried different inside turns between the gaps of the jumps with Holly Shepherd and Cascaron, owned by Margaret Camp, being one of the first to try some tighter turns to move up the ladder. The pair earned an 89 for a total of 173. Doug Boyd and Mimi Rothman’s Calido’s Son, also did an innovative turn after the bending line, turning to the right, the opposite of the rest of the class. His efforts earned a 91 for a total of 177. Hammack rode a smooth round on Cassie Berke’s Ducati to earn a 95 to go with her first round score of 94 for 189, taking the lead. She also earned a 92 on her second ride for Berke, Claudius, also in the hunt for a good ribbon with a total of 181. Frey played it safe with a nice tidy round and a good gallop to the last jump on Nina Moore’s Kodachrome. Moore owns the Lamplight facility and was ringside to watch her new horse perform. Alfano put in a beautiful, smooth round with a nice gallop to the last jump, earning her a 97 for the new high score of 192 and the top prize. 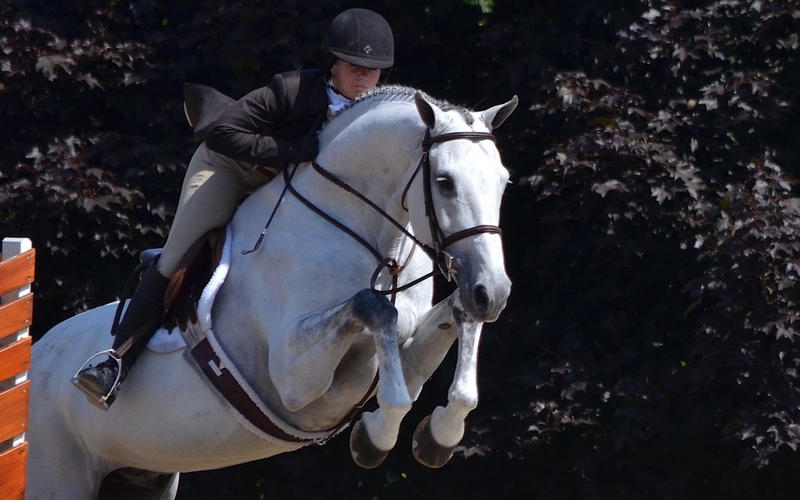 Alfano has had a good run at Equifest, earning several division championships earlier in the week in the hunters and last year, she won the International Derby aboard Jersey Boy. Candid was perfectly turned out, right down to his stars. 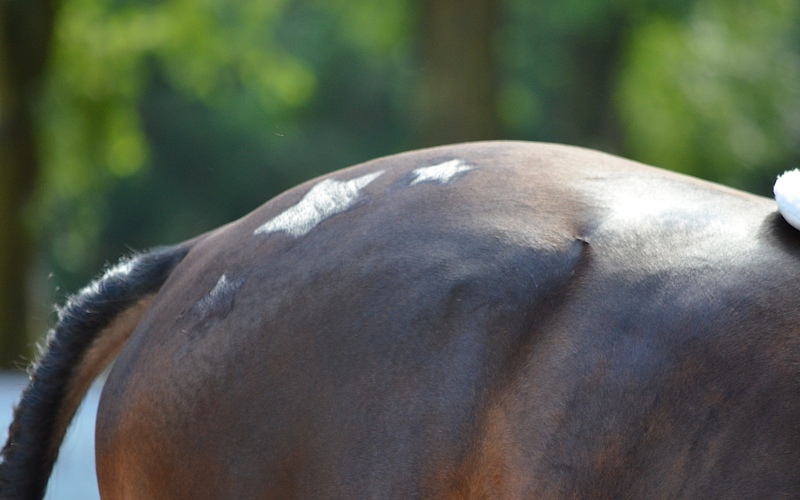 Yes, Alfano’s grooms know her obsession with stars, so they planned the entire evening prior planning how to tastefully add stars to Candid’s hindquarters. They usually checkerboard Alfano’s derby horses but this time, Candid sported three stars on each side instead, and indeed, they proved lucky as he was the star today. As Alfano watched a few of the other rounds, it didn’t change her game plan for the handy round. “I’m just lucky that he’s mine,” Alfano added with a smile. Taking the second place spot was Tiffany Hammack and Ducati, putting in smooth rounds both times. Finishing in third was Frey and Kodachrome, another pair taking on their first derby together. Competition continued in the main hunter ring with a pattern of double victories throughout the rest of the day. Reagan Rast claimed both the Medal and Maclay. The first double victory was Reagan Rast, with a win in the ASPCA Maclay and USEF Pessoa Medal. Rast and her mount, Global Connection, or “Conner,” put in consistent rounds in order to garner the top honors. The Kansas City, Kansas-native spoke highly of her mount, who she just started riding this past April. “He has such an electric front end but you don’t even feel it too much in the air. He is a talented horse who did well in the metered classes in England as well,” said Rast. Imported in January, Conner is still newer to the Hunter/Equitation circuit but clearly fitting in well. Rast’s goal for the two prestigious classes was to simply get around smoothly. This was Conner’s first time doing both the ASPCA Maclay and the USEF Pessoa. Rast is already qualified for both Maclay regionals and the Pessoa Medal from another mount and plans to attend both Finals in the fall. Topping both of the Modified Junior/Amateur 3’3” Hunter classes with consistent rounds was Sydney Hott with her mount Primera. Coming in second in both also was Colby Hassfurther and her mount Zilver Star. The third and final double victory of the day was in the Modified Junior/Amateur 3’ Hunter class, with Heather Zuber and Kalifornia winning them both. 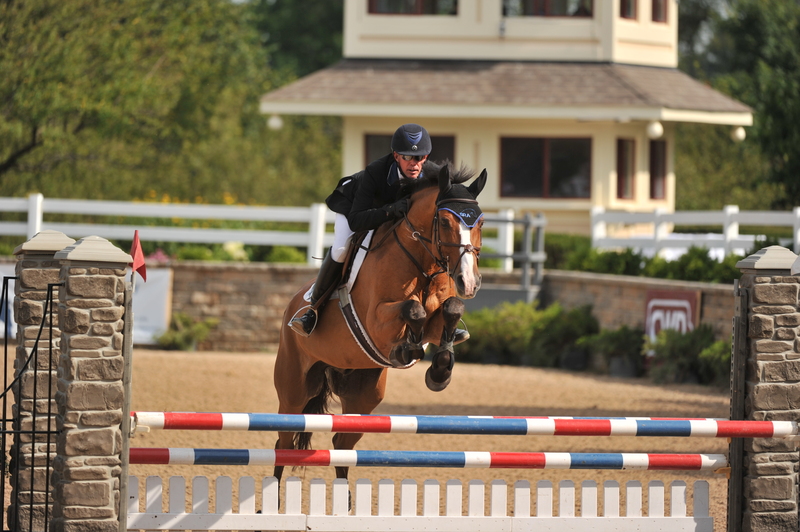 Michael Burnett and Iron topped the $1,000 Junior Amateur Jumper Classic. Photo Elizabeth Stein. 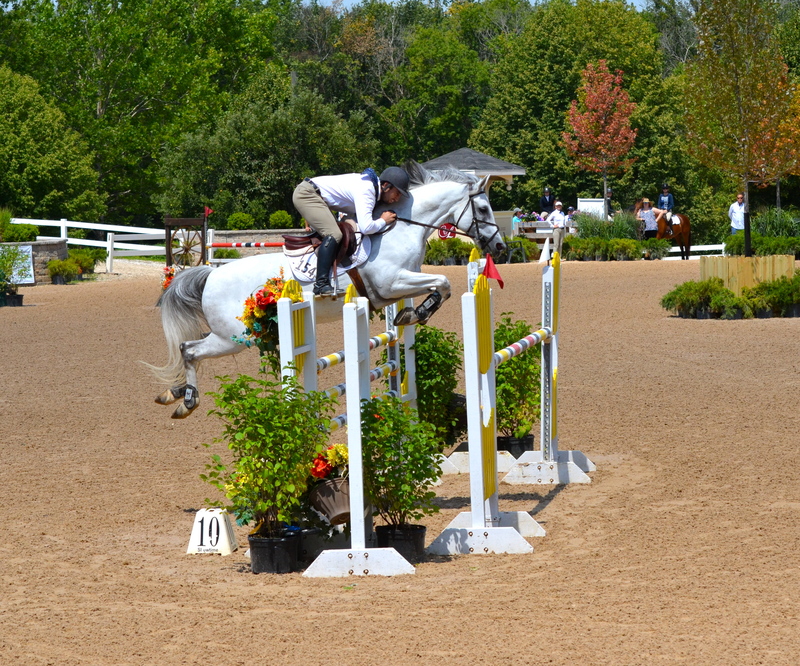 Competition in the SmartPak Grand Prix arena continued today with the $1000 High Junior/Amateur-Owner Jumper Classic. The course, designed by Mark Esparza, tested all contenders with only two riders going double clear. Michael Burnett aboard his 12-year-old partner, Iron, with a jump-off time of 35.377, and Emma Sargent aboard her No Fear with a jump-off time of 39.654 were the two double clear rounds. Burnett was the first rider in the ring and led the class the whole way through. Burnette is not new to being on top in the ribbons, having won the $15,000 Grand Prix at the Lake St. Louis Winter Festival this past January, and many top grand prix finishes since then. In terms of strategy, Burnett wanted to stay in control. The theme continued with Sargent who was able to watch Burnett’s ride and alter her plan to go clean. The third place finish went to Annie Bolling aboard Casseur with 39.538 seconds but an unfortunate four faults and Caelinn Leahy aboard Esquilino Bay took fourth. Doug Boyd and Relection. Photo Andrew Ryback. Douglas Boyd, head trainer and manager of Sapphire Riding Academy in Mettawa, IL, had a winning morning in the 1.25m and 1.35m jumpers. In the 1.25m class, Boyd was last into the ring aboard Reflection, and had a double clear ride with 32.672 on the clock. “With Reflection, I just let him go for it. He’s a well-seasoned, well oiled machine. I just sort of guide him. I give him all the credit,” said Boyd on his 18-year-old partner who he has only had about eight months. Doug Boyd and Berkley III. Photo Andrew Ryback. 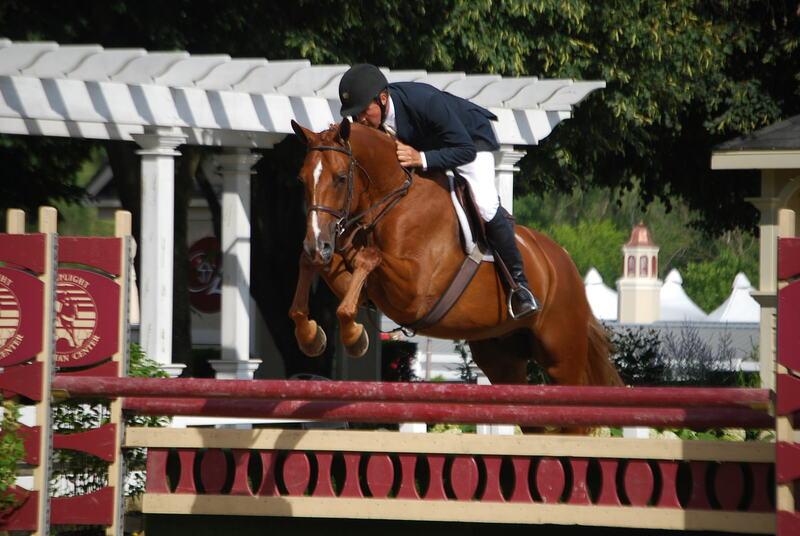 In the 1.35m jumpers, Boyd rode Berkley III to the victory. This horse is a new ride for Boyd, who only just purchased the 8-year-old this January. They cleared the jump-off course in a speedy 37.445. “He requires a big jump to keep his attention. He’s a hot horse I’ve worked really hard to settle him down, and he’s progressed really well,” Boyd added. In the 1.20m, Holly Shepherd took the blue with HJ Platinum and in the 1.30m Carolina Villanueva aboard O.M.S. Checkers 5 took home the bacon. Equifest I competition continues with the $75,000 Grand Prix on Saturday at 4 p.m. 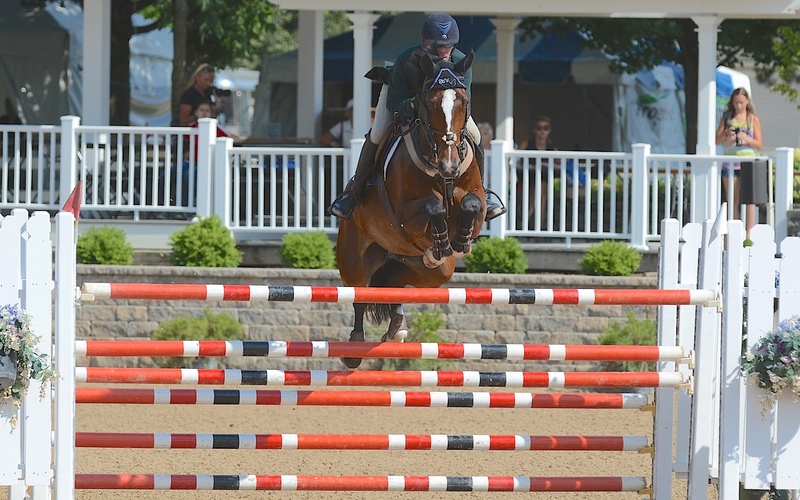 The two-week Equifest Show Series at Lamplight Equestrian Center in Wayne, IL, runs July 22-26, 2015 and July 28- August 2, 2015 and is a USEF Premier rated show. 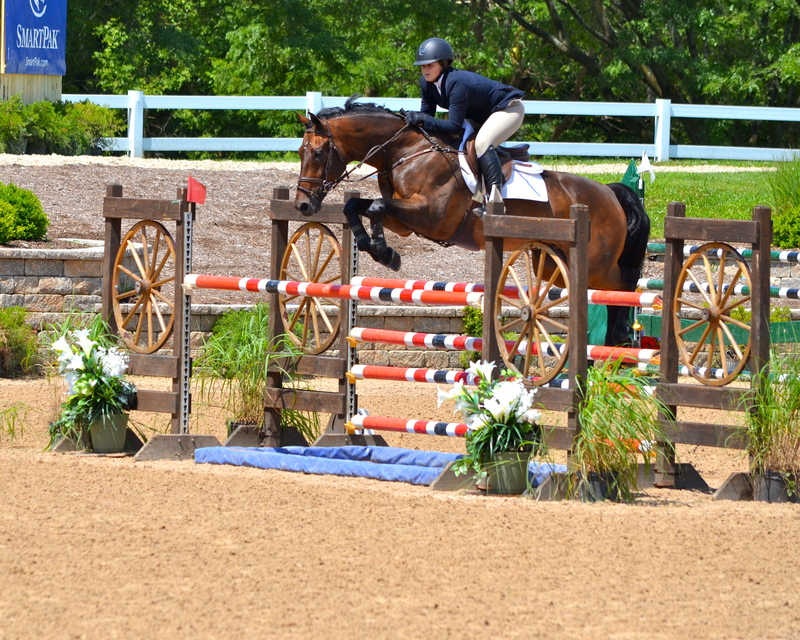 Week two is a World Championship Hunter Rider (WCHR) rated event offering a $25,000 USHJA International Hunter Derby and a $5,000 USHJA National Hunter Derby. 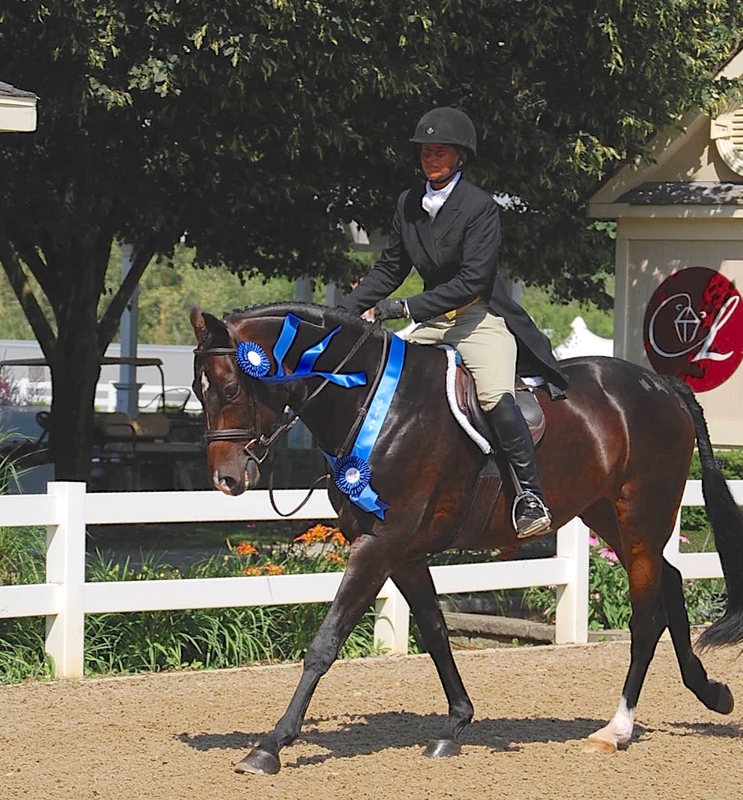 Both weeks of Equifest offer top prize money, classics and Pre-Green incentive classes for hunters. In addition, the premium show is a USHJA 2014 Member's Choice Award Winning Horse Show, rated by its members as an exhibitor friendly show and facility. Managed by Allen Rheinheimer, the show also offers a $75,000 Grand Prix and a $25,000 Welcome Stake week one with a $50,000 Grand Prix and a $30,000 Jumper Derby week two.